Chinchillas are very clean animals and hate to live in dirty surroundings, therefore cage maintenance is of paramount importance to ward off health issues and promote vitality and well-being. Chinchillas cannot be truely litter trained although you will find with regular observance, your chinchilla prefers to urinate in one particular area of the cage but droppings are scattered everywhere. Fungus love to grow in dark, damp, unkempt and stagnant environments and an unhygienic cage will manifest in underlying illnesses and poor health. The cage location should be considered with weekly maintenance on mind to ensure the inside of the cage environment has easy access for unhindered cleaning. The less you have to hunch over to clean a chinchilla cage, the more likely the job will be completed quicker and more efficiently. 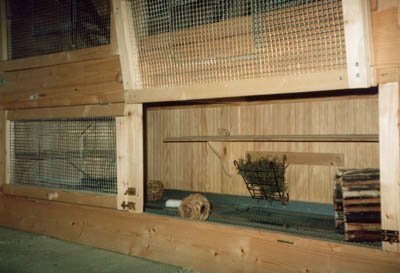 The maintenance of the cage will very much depend on the cage layout, the enclosed essentials and format of the cage, whether it be a solid or wire bottom cage. The list below shows a basic outline of what should be considered when maintaining the health of a chinchilla cage and helps promote good husbandry on a regular basis. You must change the chinchilla's water system daily. This means, cleaning the water bottle and replacing the existing water with fresh boiled water that has been allowed to cool. If water isn't replaced daily and algea is allowed to accumulate in the water bottle it encourages the build up of Pseudomonas Aeruginosa, which will lead to disorders such as diarrhoea, oral ulceration and septicaemia. Remove any food debris and soiled hay and replace with fresh. Both pellets and hay must be changed daily even if they looked untouched. A chinchilla can drop faeces into its food bowl contaminating pellets or have even been know to urinate on pellets and hay. If a chinchilla has a dustbath within its cage, then the sand will also need to be sieved through or replaced if the chinchilla has used the bath to urinate in. Each week the chinchilla cage should be properly cleaned. The old waste in the litter tray will need to be disposed of and the tray sterilized with disinfectant before rinsing well with water. You must make sure the tray is completely dry before re-lining or you will cause fungi to grow within the damp corners. Water bottles must be completely sterilized in boiling water and cleaned thoroughly using a bottlebrush to prevent poisonous algae forming in the nozzle or container. Never use bleach or any hard detergents on the water bottle - a tiny amount of soap detergent will be appropriate. Thoroughly rinse the bottle and the nozzle until the water runs clear with no bubbles remaining. Replace the chinchilla's dust bath with new and ensure no loose fur has built up around the cage. It is advisable to brush down the inside of the cage weekly, focusing on the joins and especially the back of shelving. Every month completely clean out the cage. Take out all the furniture and give the cage a hoover all the way through. Wash anything that can come in contact with water, for example, toys and the dustbath tin and follow the weekly chores before replacing you chinchilla back inside. Give the cage a complete 'spring-clean'. Take everything out and disinfect not only the inside of the cage but the outside as well, making sure it is rinsed well with water before drying. Sand down or replace any shelving that has become soiled and disinfect all the chinchilla's toys. Any items that cannot be sterilized should be thrown away and replaced with new. Chinchilla Cage, Chinchilla Cage Necessities. a fast and easy job!